I dyed these various shades of yellow and orange from the meadows of wild goldenrod blossoms that I hand harvested from. Other blossoms like coreopsis and marigolds I grew in my garden. At a time of life when I feel metaphorically like I am in the midst of winter I gathered this bouquet of woolen yarn together and I found beauty weaving this blanket which I am gifting. What a blessing these simple flowers which once brightened my garden and summer day's again brought their joy into my life. If only I could be as beautiful as they are. Isn't that God's plan for each one of us? I take comfort knowing everything moves in circles. Winter is passing and spring will come. "Weeping May endure for a night, but joy cometh in the morning." Psalm 30:5 I see more of God's great love for us in this circle of life. "If we had no winter, the spring would not be so pleasant; if we did not sometimes taste of adversity, prosperity would not be so welcome." Anne Bradstreet in Meditations Divine and Moral. A special thank you for my precious daughter who modelled this blanket for her uncle in the forest near our cabin. Ronda, you are truly gifted. The blanket is gorgeous and you daughter is beautiful, even from the back! I love your words today, too. And I agree, my grandmother used to say that about happiness. It's a momentary thing and it's supposed to be so when it comes it's really special. Enjoy that blanket! What a scrumptious piece of art! And summery, heartening colors there in the damp and dark winter forest. God bless you, Dear sister in Christ! May He continue to give you His persevering strength. What a beautiful blanket in subtle colors; I can not imagine creating that. Beautiful!!! It looks warm and cozy! 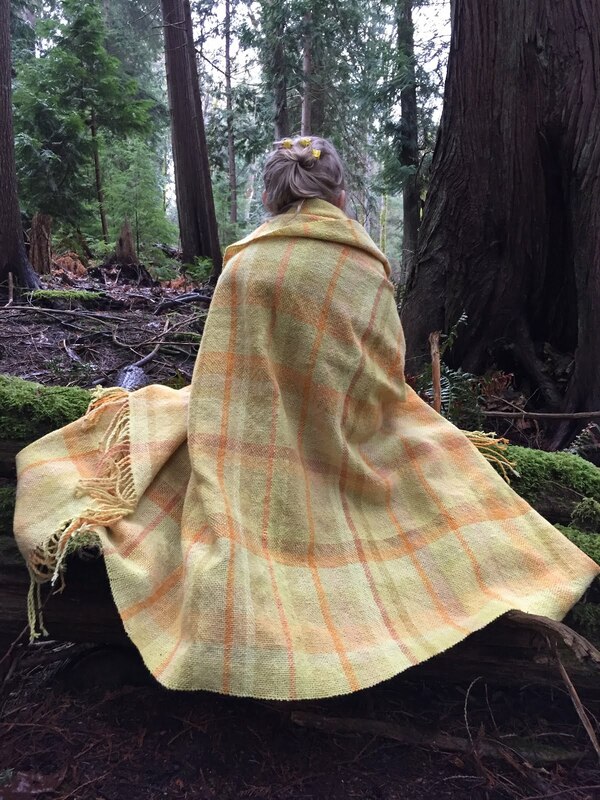 Oh I do love the yellows you found to create the color in this blanket, it is gorgeous, and your daughter is a darling model! I too believe that the seasons of life are necessary, just like the seasons in nature, for us to appreciate truly the beauty in each one. I'm glad that we get to enjoy the full four seasons where we live, don't you? Blessings to you sweet friend!